Many salaried persons don’t get unsecured loans from banks, due to strict guidelines from the regulator. Banks restrict doing so to borrowers who earn above a certain limit, such as Rs 25,000 a month, and employed with reputed companies. Also, if you are looking for a small loan of, say, Rs 25,000, banks might not show interest, due to the cost they incur. “Even in developed countries like the US, only 20 per cent of the population has access to credit at moderate interest rates,” says Vaddadi Shankar, founder of i-lend.in. “Now, such left-out borrowers can turn to online platforms that connect them to individual lenders willing to take the risk. Termed peer-to-peer (P2P) lending, it is not new to India. Many proprietors and the unbanked population borrow from individuals. In this case, there’s a middleman who knows the moneylender and can vouch for the borrower’s credentials. The online platforms work more like a bank. There’s evaluation of credit worthiness and repayment capacity. An equated monthly instalment (EMI) is fixed. Borrowers and lenders need to go through Know Your Customer (KYC) requirements. Borrowers with lower credit risk get a lower interest rate and vice versa. The rate varies between nil and 36 per cent. The loan amount can be as low as Rs 25,000 and as high as Rs 5 lakh, for tenures between six months and three years. Bhuvan Rustagi, co-founder and operations head at Lendbox.in, explains that unlike taking a loan from a bank, these platforms are do-it-yourself. So, there will be no executive visiting to collect documents and provide other services. A borrower needs to scan and upload documents for KYC, such as photo, PAN card, Aadhaar card and passport. Then, they need to provide income-related documents such as six months’ bank statement, three months’ salary slip and income tax returns. Many of these platforms charge a registration fee and also a processing fee from borrowers. i-lend.in, one of the oldest players, charges Rs 500 for registration and one per cent as processing fee. 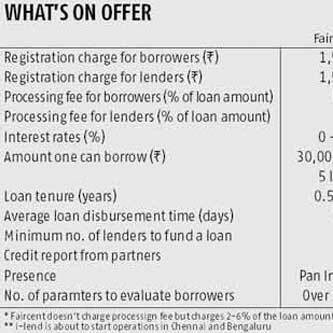 Another popular platform, Faircent.com, charges Rs 1,500 for registration, later adjusted in the processing fee when the borrower gets a loan. “The registration fee is to ensure only serious borrowers come to the platform. In the early days of operations, many borrowers backed out at the last minute,” says Rajat Gandhi, founder and chief executive (CEO) at Faircent. Many of these companies also have registration charges to cover the costs associated with KYC and physical verification. Are You a Smart Borrower? Peer To Peer Lending Decoded! Why peer to peer lending platforms are a prudent choice for investors? Don’t postpone life – InstaMoney Hai Na! 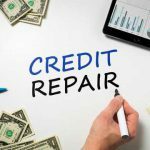 How To Get A Loan With A Bad Credit Score & Tips To Improve Credit Score! LenDenClub is one of the fastest growing peer to peer (P2P) lending platforms in India. It connects investors or lenders looking for high returns with creditworthy borrowers looking for short term personal loans. Our automated, simple to use, transparent and hassle free P2P lending platform ensures that the borrowing needs of salaried individuals are met quickly and efficiently. By connecting lenders and borrowers in the peer to peer lending space, we create a win-win situation for both lenders and borrowers. Reserve Bank of India does not accept any responsibility for the correctness of any of the statements or representations made or opinions expressed by Innofin Solutions Private Limited, and does not provide any assurance for repayment of the loans lent on it. LenDenClub is an Intermediary under the provisions of the Information Technology Act, 1999 and virtually connect lenders and borrowers through electronic platforms of website and/or mobile app. The lending transaction is purely between lenders and borrowers at their own discretion and LenDenClub does not assure loan fulfillment and/or investment returns. Also, the information provided on the platform are verified or checked on the best efforts basis without guarantying any accuracy in the data/information verification. Any investment decision taken by the lender on the basis of this information is at discretion of the lender and LenDenClub does not guarantee that the loan amount will be recovered back from the borrower fully or partially. The risk is entirely on the lender. LenDenClub will not be responsible for the full or partial loss of the principal and/or interest of lenders’ investment.